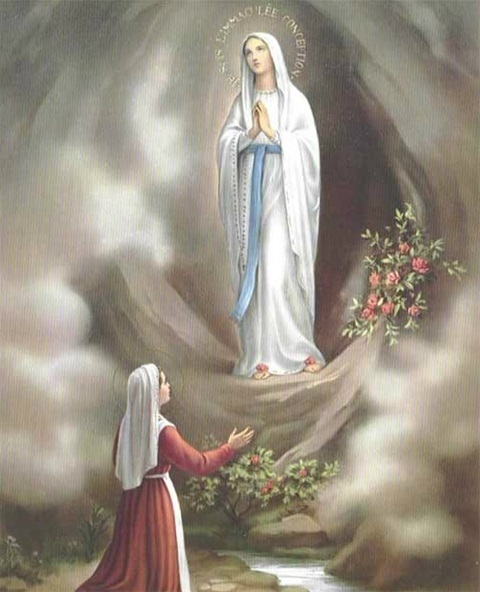 February 11, 2019: APPARITION OF THE BLESSED VIRGIN MARY IMMACULATE (AT LOURDES). O God, by the Immaculate Conception of the Virgin, You prepared a worthy dwelling place for Your Son; we humbly beseech You, that, celebrating the Apparition of this same Blessed Virgin, we may obtain health of soul and body. Through the same Christ our Lord. Amen. Rumours of favours received at the holy grotto spread rapidly, and the crowds of devout visitors increased daily, so that the Bishop of Tarbes, who had been impressed by the candour of Bernadette, found it advisable to hold a judicial enquiry into the facts. In the course of the fourth year he gave sentence, recognizing the supernatural character of the apparition, and permitting devotions to our Lady under the title of the Immaculate Conception to be held in the grotto. A chapel was soon built, and since then every year has witnessed innumerable pilgrimages from France, Belgium, Italy, Spain, and all parts of Europe and America [Note: This Church is currently under the control of the unlawful Vatican II sect's, “puppet government in Rome.” Use extreme caution. -The Webmaster]. The name of Our Lady of Lourdes has become famous all over the world, and cures are obtained everywhere by use of the water. Click here, to read the details of the Apparition of Mary Immaculate at Lourdes. Taken from: Saint Joseph Daily Missal, Imprimatur 1957.